Launched in 1914, this 35-foot, seven-inch speedster is a link to the glorious past of the Herreshoff Manufacturing Company of Bristol, Rhode Island, creator of the S Boat, the Buzzards Bay 15 and the NY 30, 40 and 50 – temples of racing sail. 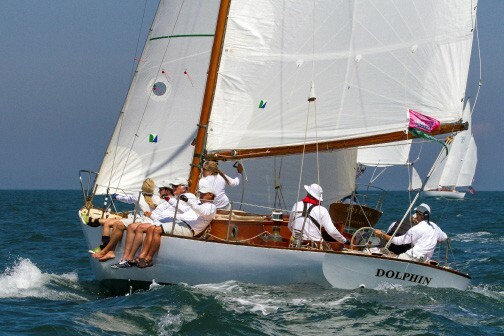 Acknowledged as having won more trophies than any other boat in American yachting history, Dolphin was meticulously restored by master boatwright Donn Constanzo at Wooden Boatworks in Greenport, NY. She overwinters in Greenport and spends summers in Oakcliff’s fleet of vintage wooden racing yachts. By my calculation it was 50 years ago as a junior sailor at Bristol Yacht Club, across from the fabled Herreshoff yards, that I first saw Dolphin, the design inspiration for a special class in Nantucket called the Alerion, named after Captain Nat’s own lunch sailing boat. Throughout the ‘60s, I saw this ghostly white sloop with her big main and overlapping genoa win over the new fiberglass production models. Come Pearson, come Cal, come Columbia – this lovely wooden boat, piloted by the family of John Lockwood, routinely handled them all. The original Alerion, in Herreshoff’s trademarked Seafoam Green color, is displayed in the Small Craft Exhibit at Mystic Seaport in Mystic, Connecticut. 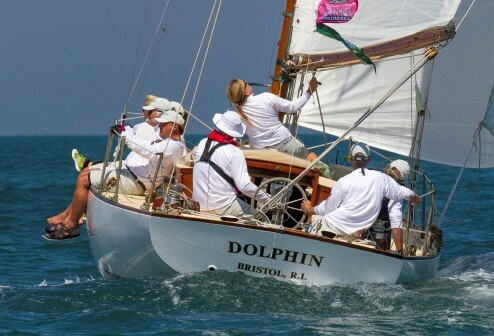 Dolphin, with sponsorship from visionary Oyster Bay sailor Hunt Lawrence and under the leadership of Oakcliff Executive Director Dawn Riley, is enthusiastically raced in Oakliff’s Classics Sunset Race series on Thursday evenings in the summer. In Nantucket, we sail a downsized version of Dolphin called the Nantucket Alerion Class Sloop, a cold-molded, elegantly trimmed 26-foot day boat built by a local yard, Sanford Boat Company, Inc. The sheer, the neatly carved bow reminiscent of the Bermuda fitted dinghies that Captain Nat saw in Bermuda during winter stays, and the well turned transom turn the heads of all visitors who come by ferry around Brant Point and see the gaggle of bobbing Alerions: “Ooh, ah! Look at those lines.” Although pricey for a day boat, the Alerion 26 is a beautiful blend of traditional wooden construction and modern technology. Fifty years ago, at the very first Block Island Race Week in 1965, Dolphin was a winner. I suggested that we bring her to Nantucket for Race Week and some tuning up in the Sail Nantucket Regatta prior to the extravaganza on Sunday, August 16 that would send 51 modern and traditional wooden craft on a circumnavigation of Nantucket Sound in pursuit of the Opera House Cup. My Alerion 26 skipper, Chicago investment manager Brian Simmons, took the bait. Hosted by Nantucket Yacht Club and Great Harbor Yacht Club to benefit Nantucket Community Sailing, and a certified Sailors for the Sea Clean Regatta, Nantucket Race Week comprises nine days of racing with a one-design series, International One Design and 12 Metre regattas, a kiteboard and windsurf regatta, a Laser regatta, youth regattas, a women’s regatta, a Hobie regatta, team racing, and more. A full slate of social events includes dinners and parties, a classic yacht exhibition, and VIP test drives courtesy of title sponsor Porsche. The event culminates in the Opera House Cup Regatta, a race that the owner of a Nantucket restaurant, the Opera House, established in 1973 as the first competition for classic wooden boats. 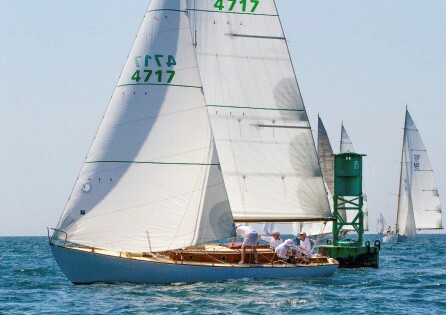 It turns out that in 1975 the Lockwood family, who owned Dolphin for 60 years before Oakcliff took her over, traveled the 50-odd miles from Shelter Island to participate in the Opera House Cup Regatta, which today is a part of the Panerai Classic Yachts Challenge. The two oldest boats in the event were Dolphin and her Bristol RI harbormate, the NY 50 Spartan, built in 1912, herself a 72-foot echo of mighty America’s Cup designs like Reliance, the largest craft tip to stern to sail for the Cup. Both would win their divisions in the Opera House Cup, and both would have a story. So eager was our crew to sail Dolphin that we drove a picnic boat all the way to Vineyard Haven to collect her on the Tuesday before the Cup. In the midst of a very sunny summer, however, we picked the day that 30-knot winds and torrential rains turned the Muskegat and Tuckernuck Channels into a mad froth, complete with standing waves and the occasional whirlpool. It wasn’t hard to convince the delivery team that discretion was the better part of valor, so we waited until Wednesday for better weather. Displacing about 17,000 pounds and with a sail area up to 500 square feet Dolphin is a big little boat, powering on a reach with 14 knots of true wind at 7 knots, carved bow handling chop and slop without so much as a teacup on the deck. We marveled at the boom-mounted mainsheet winch, the original Herreshoff hardware in brass, and a spinnaker pole about the size of a Blue Jay mast and, in spruce, irreplaceable. None of us were much accustomed to the runners and the lack of a vang. The tricks of sailing a traditional wooden mast with a hefty topping lift and a traveler perched on the transom are numerous, and boat captain Avi Lessman was quick to point them out. After a windless Thursday in which we figured out the rigging, we entered her in the second spinnaker division of Friday’s Sail Nantucket Regatta. To our surprise, our PHRF rating of 198 had us getting 100 points from the similar sized J/105 sailed by the Nantucket Community Sailing big boat youth team – clearly the Dolphin of its 1990s origins. Division 1 of the Sail Nantucket Regatta had Wild Horses, the W 76 from Newport, along with two HPR machines, Interlodge from Newport and Decision from New Orleans. In Division 2, we were up against the 105s and a pair of W 46s. What chance did we have? In 14 knots and under and sporting an old Hood spinnaker, we slipped around the course for a fourth and a second, earning us third place in a tiebreaker for the day. Official Race Week Photographer Karen Ryan snapped away when we set the chute. The week’s only glitch came when the engine, with the fuel tank almost empty, developed the dreaded vapor lock. That required our skipper’s son, employing his 20-foot powerboat, to play tugboat and return us to Straight Wharf and an admiring crowd at Saturday night’s Opera House Cup Classic Yacht Exhibition at Nantucket Boat Basin. The penultimate day of Race Week (there’s a beach cleanup at Jetties Beach on Monday) began with the traditional parade of boats around the Brant Point Light led by the local Beetle Cat fleet, locally known as Rainbows. The 43rd annual Opera House Cup started at 1100. The newest craft in the 51-boat fleet was Foggy, a collaboration of designers German Frers and Frank Gehry and built by Brooklin Boatworks in Brooklin, ME and launched this summer – an exotic wood/carbon composite maxi with electronic everything. In our Class II, we started after the Alerions (Class I) with the two NY 30s, Amorita and Cara Mia, both Rhode Island boats, jumping out as author and Nantucket resident Nat Philbrick’s modern wood yawl Phebe dueled with us. This was a Technicolor day for the Opera House Cup. This race is usually run northwest out to the middle of Nantucket Sound, turning east to Great Channel, and then south past Great Point to the finish. We dueled with another Oakcliff boat, Aiger, and saved our time after being nipped at the finish boat-for-boat. At the party, after one of the most serene Opera House Cup races in modern history, we discovered that indeed the machine Foggy had won the Cup, but the two oldest craft in the race, Dolphin at 101 years and Spartan at 103, had taken their respective Vintage divisions. Opera House Cup title sponsor Panerai awarded the customary watch to the winner of the Alerions, Bruce Failing’s Bapple, for best performance overall. The odyssey was over for Team Dolphin. We had delivered the goods on the 40th anniversary of this remarkable boat’s first appearance in the Opera House Cup. Tom Darling was co-captain of Team Dolphin. His article about IODs, “A Tale of Two Sixes,” appeared in our July issue.